Click here to download a Declaration Of Candidacy form. Click here to download a form to declare a slate. 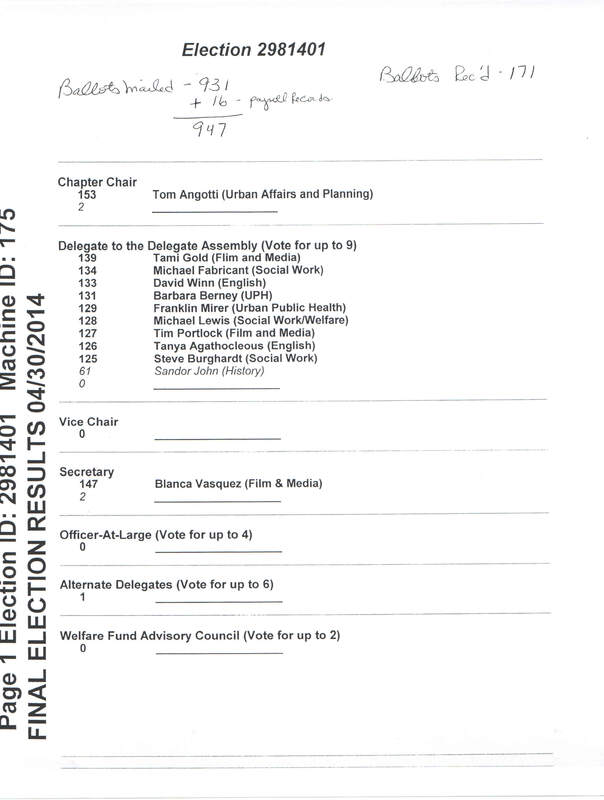 ELECTION RULES: Election rules were revised by a vote of the Delegate Assembly on June 18, 2015. Click here for the revised rules. Here a summary of the relevant laws and rules covering union elections prepared in advance of the 2018 election. Please read these carefully and contact Director of Legal Affairs Peter Zwiebach (pzwiebach@pscmail.org or 212-354-1252) with any questions. In April 2018, the PSC held elections are for the union’s principal officer positions of President, First Vice President, Secretary, and Treasurer; for Vice Presidents for Senior Colleges, Community Colleges, Part-Time Personnel and Cross-Campus Units; and for the other 19 positions on the PSC Executive Council. Members also elected delegates to the AFT, NYSUT and AAUP. The Elections Committee certified the results of the 2018 PSC elections on Monday, May 7. PSC President Barbara Bowen, Treasurer Sharon Persinger and Secretary Nivedita Majumdar were all re-elected. Andrea Ades Vásquez was elected to the position of PSC First Vice President. Full results of the election are posted here. The term of office starts on Monday, May 21. The deadline for filing for candidacy for the upcoming union-wide elections is January 8, 2018. The declaration of candidacy form is available here online. The spring elections are for the PSC’s principal officer positions of President, First Vice President, Secretary, Treasurer; for Vice Presidents for Senior Colleges, Community Colleges, Part-Time Personnel and Cross-Campus Units; and for the other 19 positions on the PSC Executive Council. Members will also elect delegates to the AFT, NYSUT and AAUP. To vote, one must be a PSC member as of December 4, 2017. All but two of the elections were uncontested. Click here for the official count for the two contested elections at Hunter College and the Graduate Center. The effective date of office for the spring chapter elections is May 27, 2016 – 3 year term. All of the elections were uncontested but two. The official count for the two contested election (CSI and BMCC) is available here. Sixteen chapters are scheduled for election in April 2016. Up for election are Chapter Officers, Delegates and Alternates to the PSC Delegate Assembly and PSC-CUNY Welfare Fund Advisory Council. The Term of Office is 3 Years. To vote, one must be a member of the chapter as of December 1, 2015. Broadway – Ste. 1500, New York, N.Y. 10006, by 5:00 pm, March 2, 2016. 4. Ballots will be mailed to members’ home addresses on April 1, 2016. 5. Ballots will be counted April 29, 2016. For a list of chapters up for election, more details and the official election notice, click here. The deadline for filing for candidacy for the upcoming union-wide elections is January 9, 2015. The declaration of candidacy form is available online at tinyurl.com/psc-candidacy-declaration. The spring elections are for the PSC’s principal officer positions of President, First Vice President, Secretary, Treasurer; for Vice Presidents for Senior Colleges, Community Colleges, Part-Time Personnel and Cross-Campus Units; and for the other 19 positions on the PSC Executive Council. Members will also elect delegates to the AFT, NYSUT and AAUP. To vote, one must be a PSC member as of December 1, 2014. Thirteen PSC chapters held elections in the spring of 2014. The chapters elected their local officers, delegates and alternates to the PSC Delegate Assembly, and representatives to the PSC-CUNY Welfare Fund Advisory Council. Most races were uncontested, though there was a contest for one of Hunter College's seats on the Delegate Assembly. The election results were certified by the Elections Committee on May 12. The term of office for the newly elected candidates begins on May 27. Click here for the vote counts for the uncontested elections, here for a list of who was elected and here for the vote count of the Hunter College election. Votes in the election for PSC chapter positions at the College of Staten Island (CSI) were counted by the American Arbitration Association on November 1. The results were certified by the PSC Elections Committee on November 12. No challenges were filed. The Elections Committee submitted its report on the vote to the PSC Delegate Assembly, which approved them on November 14. Click here to see the results. 2013 CHAPTER ELECTIONS: Thirteen PSC chapters held votes in April to elect chapter officers, delegates and alternates to the union’s Delegate Assembly. Seven campuses also voted to elect representatives to the PSC-CUNY Welfare Fund Advisory Council. The Elections Committee certified all the elections except for the vote at the College of Staten Island. A new election for PSC chapter positions at the College of Staten Island (CSI) will be held this fall, on or about October 1. When the American Arbitration Association counted the votes in the Spring 2013 CSI faculty chapter election, it reported that some candidates from each of two competing slates had won. Representatives of the Brand New Day slate accepted the results; representatives of the CSI-New Caucus slate challenged the election and alleged four violations. The Elections Committee dismissed all these allegations, but found another issue that it concluded could have had an impact on the outcome, and was thus reason enough to order a new election. The PSC Elections Committee June 2013 report summarizes the Committee’s findings. The PSC Constitution has a three-year limit for terms of office. Therefore, the previous chapter officers’ terms have expired. They no longer represent the PSC on campus.The CSI faculty chapter election re-run will take place on or about October 1st 2013. PSC members at CSI will receive more details by mail in advance of the vote. Click here for a report listing the elected chapter chairs and voter participation (ballots mailed, numbers voting and slate votes). A full listing of all chapter officers elected is available here. PSC Officers and Executive Council. Delegates to the AFT convention, NYSUT RA and AAUP Annual Meeting..
2011 CHAPTER ELECTIONS: On Thursday, May 12, 2011,the PSC Elections Committee certified the results of the Spring 2011 chapter elections. Half of the chapters were up for election, virtually all uncontested. Technically, the only exception was Hunter College, but even there only six candidates (five slate and one independent) ran for nine open delegate positions, meaning all were elected. Click here for a list of who was elected. 2010 CHAPTER ELECTIONS: On Wednesday, May 12, the PSC Elections Committee certified the results of the Spring 2010 chapter elections. Elections were scheduled for 16 chapters, but at two (the Brooklyn and Queens EOC chapters), there was no contest because no candidates filed to run. At eleven campuses, slates or candidates ran uncontested. There were three contested elections: the HEO chapter, Medgar Evers College and Kingsborough CC. The incumbent slate won in the HEO election (New Caucus) and at KCC (Faculty First). The New Caucus at MEC defeated the incumbent College Alliance at Medgar Evers. The winning candidates in all the chapter elections assumed office ten working days after certification -- Wednesday, May 26. Click here for the count of the three contested elections (all positions) by the American Arbitration Association. Click here for all 2010 chapter election results.